From Elizabeth Zimmermann, who “revolutionized the art of knitting” (New York Times), the classic knitting bible that removes the frustration and puts the fun back into knitting with easy-to-follow instructions and timeless designs. Do you love to knit—and hate to purl? Have you ever started a sweater without enough yarn from the same dye lot to finish it? When you cast on, do you end up with a tail of yarn that’s maddeningly too long or too short? Elizabeth Zimmermann comes to the rescue with clever solutions to frustrating problems and step-by-step instructions for brilliant, timeless designs. Watch caps, socks, slippers, mittens, and more! Most people have an obsession; mine is knitting. Your hobby may be pie-baking, playing the piano, or potbelly-stove collecting, and you can sympathize with my enthusiasm, having an obsession of your own. Will you forgive my single-mindedness, and my tendency to see knitting in everything? Carvings and sculpture remind me only of Aran and other textured designs; when I see a beautiful print my first thought is how it would adapt to color pattern knitting; confronted by a new fashion, I immediately start drawing in the air with my forefinger to see if it would suit itself to knitting, and if so, how -- which way the grain should run, if the shape could be knitted in, and what stitch would be most effective. So please bear with me, and put up with my opinionated, nay, sometimes cantankerous attitude. I feel strongly about knitting. What follows is an attempt to explain some of the ideas that come while designing knitted garments, and during the pleasant hours spent working on the plain straight pieces. I am taking it for granted that you are already familiar with the rudiments of the craft. Properly practiced, knitting soothes the troubled spirit, and it doesn't hurt the untroubled spirit either. When I say properly practiced, I mean executed in a relaxed manner, without anxiety, strain, or tension, but with confidence, inventiveness, pleasure, and ultimate pride. If you hate to knit, why, bless you, don't; follow your secret heart and take up something else. But if you start out knitting with enjoyment, you will probably continue in this pleasant path. Soft wool from the simple silly sheep can be as fine as a cobweb, tough and strong as string, or light and soft as down. There are scientific reasons why wool is the best material for knitting, and into these I will not go. I only know that it is warm, beautiful, and durable. Woolen socks never become cold and clammy, however wet. A woolen sweater is so water-resistant that when dropped overboard it floats long enough to give you ample time to rescue it. The surface on caps and mittens made of wool repels all but the most persistent of downpours. I have in mind a particularly beautiful cap made of the finest wool and angora at seven stitches to the inch in the lovely designs of Bohus in Sweden. It has been worn for two seasons by a dedicated ski-teacher in all manner of blizzards and dirty weather, and she swears that it is the warmest and driest hat she has -- snow perches on it but does not penetrate. For people allergic to wool, one's heart can only bleed. Synthetics are a marvelous substitute, but a substitute is all they are. The allergic must be grateful that they didn't live in the Dark Ages of fifty years ago when one kept warm in winter with wool, or froze to death in linen and cotton. Of course, some avoided pleurisy by swathing themselves in sables. It is true that a synthetic sweater can be washed and dried in machines, but to me this rather reduces it to the level of a sweatshirt. Washing a real sweater is akin to bathing a baby, and brings the same satisfaction of producing a clean, pretty, sweet-smelling creature -- very rewarding. There is a persuasive old wives' tale about one reason why wool shrinks. It goes, "Never wind your wool into a tight hard ball, as this will make it stretched and taut. You knit it up into a sweater. Then it gets dirty and you wash it. The wool, encouraged by the dampness, goes back to its original unstretched state, with the result that the whole sweater shrinks." Think it over. "Ply" is a frequently misunderstood concept. It has nothing to do with the thickness of yarn, except in a relative way, and everything to do with its construction. A ply is a strand of wool. Two, three, four, or more strands are twisted together to make 2-ply, 3-ply, 4-ply, or many-plied wool. Since the strands or plies can be of any thickness, it is clear that the thickness of wool does not depend on the number of plies but on the thickness of the individual ply. I have used 9-ply wool which was no thicker than 4-ply knitting worsted, and I'm sure all are familiar with 2-ply wool so heavy and bulky that it knits up at 2 1/2 stitches to 1 inch. So when buying wool be guided by the recommended GAUGE rather than by the number of plies, and compare this recommended GAUGE with the GAUGE specified in your knitting instructions. When wondering how much wool to buy, ask the saleslady. She knows by experience. If she doesn't know and isn't interested, go to another store. In fact, start off by going to the best specialty yarn shop or good department store that you can find. It is not wise to shop around for cheap wool unless you are very experienced, or are willing to risk spending hours of work on an object that will shrink, fade, or run. A well-made sweater, knitted with good will and good wool, is beyond price; why try to save a dollar on the material? Consult the nice expert in the wool shop, and if she doesn't suggest taking an extra skein as insurance against running short, take one anyway. Find out the time limit on returns and exchanges, and mark this on your sales slip. And keep the sales slip with the wool, OK? The saleslady will then love you. Even if you never get around to returning the extra skein, think what a disaster it would be to run short, and to fail to match the dye lot. Anyway, extra skeins are always useful for socks, caps, mittens, color patterns, or stripes. If you prefer to economize and love to knit, make your sweaters with very fine wool and many stitches. A thin sweater weighs much less than a great heavy one, and, broadly speaking, wool sells by weight. Fine knitting gives you many more hours of your favorite hobby before you have to sally forth and make another capital investment. Discrepancies will occur between dye lots; even with white, even with black. Never start a project without sufficient wool to finish it. But on a rainy winter's night who can resist three or four skeins of wool, pleading to be made into a sweater? "I'll go to the wool shop first thing, and match the wool." Oh dear. Famous last words. Well, there are several remedies. If you can find an almost perfect match, the two shades may be successfully blended by working them in alternate rows for an inch or two. Seams will also help to hide the slight color difference of a close match. You may make one or both sleeves of the new color, which will fool the eye. If the match is Not Good At All, you can be glad you are making a Zimmermann sweater (I hope you are). Several of these start at the bottom on sleeves and body; the three pieces are united at the underarm, and the shoulders or yoke are worked last. This offers endless opportunities for using up odd wools. Few people embark on a new sweater overnight without material to get them at least to the underarm. So when the wool runs out decide that you had decided on a sweater with a contrasting yoke anyway. Eureka. If you are determined to have a one-color garment, intersperse a few purl rounds where the dye lot change occurs. This is enough to fool most eyes, even if it never fools yours -- you know too much. You can put in a small pretty color pattern at the point of change, which may please you so much that you may decide to continue with different color patterns up to the neck. This is one way of achieving a "famous masterpiece of taste and imagination." Save a few yards of the original color for one of the last patterns, and the whole thing will look as if it had been planned. Needles are made of so many materials that you can go dizzy taking your pick. Years ago you had your choice of wood, bone, steel, or luxurious tortoiseshell and ivory. The contemporary ones are usually of metal or plastic, and are firm or flexible respectively. The U.S., for some reason, employs different size numbers from those in Europe, which are measured in millimeters. A needle gauge is a very useful thing to own, although it and the needles may vary infinitesimally, which sometimes leads to confusion. Occasionally one comes upon a mature needle gauge in which the holes have actually become enlarged through constant use, or by the forcing through of too large needles. This all points to the admonition not to take needle sizes too seriously, especially if you tend to knit loosely. Tight knitters lead a hard and anxious life. They grab needles and wool so tightly that great strain is put upon their hand muscles, nay, arm, shoulder, and even neck muscles in extreme cases. They must let go of everything from time to time, just to rest, and then resume knitting, with what looks like a careworn expression, although they neither admit, nor, in most cases, believe this. The tight little stitches they make must be forced along their (right) needle, and more tight little stitches force up along their (left) needle, to be squeezed in their turn. The resulting fabric, in knitting worsted, with #8 needles, can have a GAUGE of five stitches to one inch, because of the great tightness. The identical GAUGE may be easily and calmly achieved by a loose knitter on, say, #5 needles. If you are a beginning knitter, don't try to knit tightly in order to make your work look neat. If you are a habitually tight knitter, try to kick the habit. Loose knitting tends to make your stitches look somewhat uneven, but what of it? Are you trying to reproduce a boughten machine-made sweater? Besides, it is surprising what blocking and a few washings will do to uneven knitting. I used to think that people in the Olden Days were marvelously even knitters, because all really ancient sweaters are so smooth and regular. Now I realize that they probably knitted just as I do, rather erratically, and that it is Time, the Great Leveller, which has wrought the change -- Time, and many washings. Don't fuss too much about one size in needles; it is GAUGE that is important, and this does not invariably depend on needle size. If you want to make a sock and can find only three #2 needles, add unto them a #1 or a #3; it will make very little difference if you are a loose knitter. I have, on a bet, made a sock on four different-sized needles without ill effect. One tends to give one's fingers too little credit for their innate good sense. They feel when a too-thick needle has arrived on the scene, and will tighten up a tad. Confronted by a really skinny needle, they will help the little thing along by loosening up, and no harm done. One is in this knitting pastime for pleasure, not for toil, anxiety, and doubt, so don't WORRY. If you are a tight knitter by chance instead of by choice, practice knitting loosely, and it may change your life. Very useful in the larger sizes -- say #10 to #15. Well-worn wooden needles can become well loved. Their benevolent clack is soothing, and brings back the feeling of childhood. New needles, not mellowed, may be broken in with sandpaper or steel wool, and light applications of paste wax or linseed oil, but the best finish is attained by years of use, preferably with natural oiled wool. These have become quite rare, and should be treasured. Sandpaper helps them too. The original clicking needles, which come in small sizes, for socks and lace. They tend to rust, so get out the steel wool, and oil them lightly before putting them away. The famous old fire hazard, but why sit so close to the candle? Extremely brittle; not to be sat upon. Good rigid needles. If the outer coating has worn off, watch out when using them with natural oily wool (sometimes called "boot wool"). The lanolin in the wool causes the metal to blacken, and this will come off on your knitting. No great tragedy, as it washes out quite easily, but rather unsettling. A #6 aluminum needle has been known to furnish an excellent emergency shearpin for an outboard motor. It once saved us seven miles of paddling. Then I had to spend hours re-pointing the needle on rocks, having nobly, but foolishly, offered the business end instead of the knob end for sacrifice. An excellent rigid needle. Bends when sat upon, but is easily bent back. Splendid for those who like flexible needles. It is pure boasting to mention these. I own a few sets, and use them reverently. They are as gently curved as the tusk from which they sprang. That takes care of straight needles. Find out which kind you prefer. Some have blunter points than others and these are fine for loose knitters, while tight knitters are more comfortable with relatively sharper points. They come in sets of two, with knobs, for working back and forth, or in sets of four, without knobs, for circular knitting. In Europe they come in fives, as there the sock itself is on four needles, with the fifth one used for knitting. Emergency knobs for double-pointed needles may be made from tightly wound rubber bands, or from those rubber needle guards which are never to be found when wanted. Dorothy Case links her needle guards with wool; then they can both get lost together. To sharpen the knob end of a wood or plastic needle, try the pencil sharpener and sandpaper. Circular needles are my particular pets. They have changed enormously since my youth, when they were formed of a piece of wire with knitting-needle-like points. The joint between wire and point was far from strong, but it rarely broke apart so that you could honorably throw the thing away. One little strand of wire would come loose, and catch on every single stitch brought up to the left point to be knitted. You could resourcefully reverse the whole piece of knitting, so that the stitches were pulled over the faulty end on the right side, which didn't seem to matter, but then the other end would soon start fraying. I'm pretty sure that this is the reason for the rooted dislike of circular knitting evinced by some of my generation; I can think of no other cause. Younger people are more open-minded and love circular knitting, but suffer under a great paucity of directions for the technique. This gap I am valiantly trying to fill. Circular needles are now beyond reproach, as far as durability goes. Different versions vary considerably. You can find them in all-nylon, or in nylon with metal points, and in a great variety of lengths. I use the 16" and the 24" lengths only; the extra 3" on a 27" length just seem to get in my way. But even a 36" length is happily used by some. I like the 16" length for sleeves, caps, and children's sweaters. The 24" length will take care of any sweater, skirt or shawl that I care to make. When I tell you that once in the latter stages of an ambitious project I had well over a thousand stitches on a 24" needle, would you believe me? It's true, and I had no trouble, except that the beginning of the round became lost in the scrimmage, and I found it wise to mark the place with a generous piece of scarlet wool. Marooned on a lonely island once, for two weeks, I managed 320 stitches on a 16" needle, but this was no fun. There are in existence 11", and even stunted little 9" circular needles, but I mention them chiefly for academic reasons. I will, on occasion, use an 11" needle for making Norwegian mittens in color patterns. Working color patterns on four needles is apt to cause tension trouble when one changes from one needle to the next, and a circular needle eliminates this. But a needle so short has of necessity very short ends to grasp, and to knit holding the working end of the needle in thumb and forefinger can be tiring and disagreeable. See to it that the ends of any circular needle you buy are long enough to hold comfortably -- at least 3 1/2" on the 16" length, and up to 5" on the 24" length. Try various kinds of needles to see which kind you prefer, and build up a collection of the sizes and lengths most often used. I like to have 16" needles in pairs, so that I can work on two sleeves at once if I feel like it. All-nylon needles have slightly flexible ends, especially in the smaller sizes, and I rather like them for color patterns. However, when working any kind of Aran pattern or cable, I prefer the rigid metal ends, which enable one to dig into recalcitrant stitches on occasion. It is perfectly possible and -- in airplane seats, for instance -- desirable, to use a circular needle for working back and forth. And one runs no risk of losing a needle. Useful adjuncts for knitting are a yardstick or tape measure, scissors, needle gauge, and two large wool needles, one blunt, one sharp. Tapestry needles are all right for fine wool, but they cause knitting worsted and the heavier wools to bulk up behind the eye, and to have to be dragged through the fabric. So hunt up some larger ones. If you can find some of those markers like small safety pins with no eyes, take several cards. A smallish crochet hook will be useful on occasion. Really, all you need to become a good knitter are wool, needles, hands, and slightly below-average intelligence. Of course superior intelligence, such as yours and mine, is an advantage. Let us proceed to fabric and texture. The hundreds, even thousands, of usable stitch patterns available to knitters have been well recorded elsewhere. I shall not attempt to go into the subject, but will content myself by describing the most usual plain ones, and the particular qualities which make them suitable for various purposes. The most obvious one to start with is stocking stitch. It is not always the easiest, but it is the most often used. It may be executed in two ways; either by working back and forth on two needles in alternate rows of knit and purl, or by knitting around continuously on a circular needle, or on four needles, to form a circular seamless fabric. I use it a great deal for its severe simplicity. It allows the construction of the garment to be more clearly visible, with all its inventive increasing, decreasing, and shaping. Since I am most interested in the construction details of knitted garments, this appeals to me strongly. However, my designs may be executed in any stitch pattern that takes your fancy, as long as you reproduce the shaping correctly. Stocking stitch likes to curl; towards you from the top and the bottom; away from you at the sides. This phenomenon occurs because each stitch is infinitesimally shorter on the front than on the back, and infinitesimally wider horizontally. Therefore the fabric curls, as a piece of bread curls when the upper surface dries, and therefore shrinks. Consequently the borders of anything made in this stitch should be made in a stitch that will not curl, such as garter stitch, seed stitch, or ribbing. The borders of a stocking stitch cardigan need not be integral with the main body of the knitting -- they may be added afterwards, either being sewn on, or, better still, knitted up (picked up), and worked vertically. This will enable you to control the relative lengths of body and border, and combat the regrettable tendency of fronts to droop, frill out, or, on the other hand, pucker. All-purl is the reverse of stocking stitch, and is sometimes used for sweaters, giving them rather an inside-out look. It is excellent as a background for patterns such as cables, or the intricate convolutions of Aran (fisherman) sweater-patterns. One row of purl on a stocking stitch fabric stands out sharply, and makes an excellent turn line for a hem. Two, three, or even more rows of purl make a splendidly heavy horizontal welt or ridge. Purling will not do this for you when worked vertically; it will turn its back on you and recede. However, a vertical line of knit stitches on a purl fabric will stand out nobly. Garter stitch is the easiest of all stitches, and one of the best looking. It is achieved simply by working back and forth in all-knit. (In circular knitting you would have to knit one round and purl one round alternately -- not worth it.) Each knit stitch, as you form it, makes a smooth V towards you, and a knobby little pearl on the reverse side. Thus by knitting back and forth on alternate sides, the smooth and the knobby rows will succeed each other, each one paired with its own knobby and smooth rows on the other side. (In stocking stitch the Vs are all on one side; the knobs all on the other.) Garter stitch has no right or wrong side -- both sides are the same. Tied in with the principle of curl and counter-curl is the fact that the edges will never curl. This makes the stitch particularly suitable for blankets, afghans, and, above all, baby clothes. How often one wishes that one could, in an emergency, turn a baby's sweater inside out. With a garter stitch sweater one can. Always finish garments made in this stitch extra-neatly on the inside -- one never knows. Garter stitch has a very pronounced grain, caused by the ridges of its construction, and it is fascinating to employ it running both horizontally and vertically, so that it catches light and shadow differently. Its interesting texture is thus accentuated. Ribbing, consisting of alternating vertical lines of stocking stitch and reverse stocking stitch, is very useful in its simpler forms. It yields a splendidly elastic lower border for sweaters, and the best socks are made in all-rib, so that they cling to the ankles and don't draggle. Sweaters made in all-rib tend to adhere inordinately, so if you want to wear a ribbed sweater and retain your dignity, be sure that it has many more stitches than you would think possible. If you twist all the stitches in ribbing -- that is, knit into the back of the K stitches and purl into the back of the P stitches -- you will attain a very elastic ribbing, indeed, and a very elegant one. Or you may knit into the back of the K stitches only. When working back and forth on two needles this yields a certain elasticity, and gives the knit rib a rather pleasant irregularity, as it is twisted only every second row. Practically all my ribbing is worked on circular needles, and therefore my knit stitches can be all twisted, which is very effective, and a nice bonus for the circular knitter. Such facts back up my predilection for making knitting as diverting and pleasant as possible, but this is a very subjective matter. Some knitters get an enormous charge out of employing the most difficult methods and performing the job perfectly. They will obviously want to twist both the knit and the purl stitches in ribbing, and have my blessing. At the other end of the scale, there are those who are made extremely nervous by working into the back of any stitch whatsoever, and they should eschew it, by all means. It is not an essential part of knitting. Ribbing may be as elaborately ornamented with various cables and fancy stitches as you please, and is the foundation of the lovely Aran fisherman patterns from Ireland. As Aran stitches are basically a form of ribbing, it is unnecessary to put ribbing at the border of an Aran sweater, since it will not curl anyway. To hold in the lower edges and cuffs, you may arrange to have fewer purl stitches between the patterns for the first few inches, and then increase up to the required amount for the main body of the sweater. Increasing by "Make 1" is practically invisible in purling. Many of the original Irish sweaters have a border of a completely different series of patterns from the main body of the sweater -- usually "Tree of Life" or small cables. Knitting Techniques is a very grand phrase, and a deceptive one, for there are only two techniques -- right-handed knitting and left-handed knitting, i.e., working with the wool in the right hand or in the left hand. Right-handed knitters, who throw their wool with their right hand, are often said to knit the "English" or the "American" way. I believe that this method originated when knitting was worked on extremely long needles (or "wires"). The right needle had its end tucked into the belt, or into a sheath attached to the belt. The business ends of both needles were held with the left hand, which enabled the free right hand to feed the wool to be knitted at surprising speed. Vestiges of this technique are occasionally noticed in some knitters, who hold the end of one of our contemporary 14" needles tucked under the right arm. Most knitters who work this way need three movements for each stitch: needle in, wrap wool around it, pull stitch through. Left-handed knitters are usually those with a Continental European background (although I have noticed some Europeans knitting right-handed). They hold the wool over their left forefinger, and hook each stitch through with the right needle. Two movements -- needle in: wool through and off. Some hold their left forefinger high; some leave it low and relaxed. Some wind the wool several times around their left forefinger, and release it, a loop at a time. Some make a veritable cat's cradle around several fingers, apparently to regulate tension. But they are all left-handed knitters, and on an average far outdistance the right-handed knitters for speed. I am myself a left-handed knitter, but not by birth. At my mother's knee I was taught right-handed -- slip, over, under, off -- and thus did I achieve my first childish kettle-holders and useful navy-blue mats for putting under inkwells. In the course of time, as was then the custom, our family fell under the sway of governesses; a teaching-in-the-schoolroom governess for the older children, and a Swiss nursery-governess for the baby. Need I say that the English and the Swiss governesses knitted the right-handed and the left-handed way respectively? Need I also say that I was fascinated by the Swiss knitting, and attempted to copy it? Of course I needn't. But you may be forgiven for disbelieving the result. The year was 1920, and the English governess, noticing my unorthodox way of knitting, uncompromisingly forbade the practice of anything as despicable as the German way of knitting. 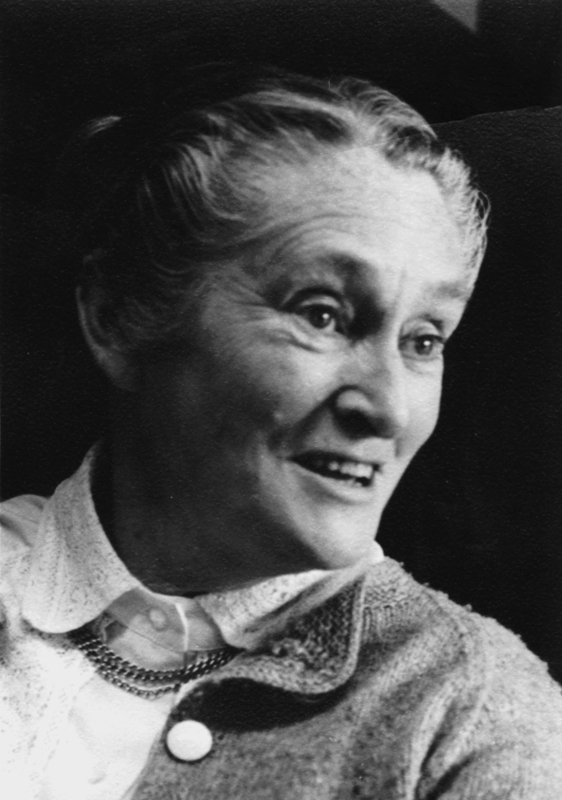 The obvious upshot was that I used to practice secretly, soon became addicted, and, after merciful release from this particular governess, came out into the open with my foreign habit, and have never looked back. One advantage of this episode is that my method of holding the wool is a little unusual, as I was self-taught. My left forefinger is held low, and is also used for holding the left needle. The wool runs over it and under the other three fingers, which manage quite happily to regulate the tension. I knit only fairly fast -- 45 to a top speed of 51 stitches a minute -- but am quite content with this, as my hands and arms remain loose and comfortable. I have not forgotten the right-handed method, and find it useful on occasion, as you shall see. So, please, knit the way you prefer, and cultivate a nodding acquaintance with the other way, as a second string to your bow. One word to left-handed knitters: in purling, some of you hook the wool through the stitch the easiest way; down and over the top of it. This makes the stitch come at you back to front the next time you work it, so that you must knit out of the back of it. Most of you know enough to compensate for this, and work out of the stitch logically, whichever way it presents itself to you, but it poses a problem to some knitters. It is really worthwhile to train yourself, when purling, to come at the thread from below, and then up in front of it, and down. Considered as a loop, the right side of the stitch should always be in front of the needle when you come to work it. Actually, there is no wrong way to knit, although there is one way which is nearly wrong. I mean Backwards, or Looking-Glass Knitting. It is not wrong in effect, as its proponents -- or shall we say victims? -- turn out perfectly creditable garments. But they work in a void of noncommunication, cut off from all run-of-the-mill knitters and nearly all knitting instructions. Those who really knit left-handed, or backwards, take their stitches from the right needle on to the left, instead of the other way around. They appear to believe that because they write left-handed they should knit left-handed too. (How they can operate a typewriter, or a sewing machine, or a telephone has always baffled me.) They forget that left-handed writing is legible to everybody, while watching backwards knitting leaves the observer feeling as if she had to decide whether to put the clock backwards or forwards in Spring, unaided by mnemonics, and at the same time patting her head with one hand and rubbing her stomach with the other, and then reversing matters. In point of fact, somebody with more agility in the left hand should take to German knitting as a duck to water, for in this method the left hand has much more to do. But the left-handed, finding it awkward to learn to knit, seem to think that this comes from their own left-handedness, and not from the natural awkwardness we all experience when learning a new skill. To be truthful, I must admit to having taught myself to knit backwards in one of my efforts to avoid my bête noire, purl. No purpose can be served by pretending that purling is too easy the "German" way. I argued -- rightly, I think -that with two-needle knitting, working across in knit and back in looking-glass knit, one could achieve stocking-stitch without the nuisance of purling. One could. But the game wasn't worth the candle, except as a feat of skill. I soon turned to circular knitting as a solution to my inborn dislike of purling. Why do so many of us object to purling? Is it because as children we are taught to knit first, and are then presented with purling as the second and more difficult step? Who knows? Who is willing to take a little innocent child and teach it to purl first? You must admit it's the trickier of the two. Of course, purling is not so bad for right-handed knitters; in fact I know several who knit with the wool in the left hand and purl with it in the right hand. However, this doesn't save them when it comes to pattern stitches involving knit and purl. This is a vale of tears and no mistake. Things are not perfect, and we wouldn't appreciate it if they were. It is important to cast on quite loosely. If you find this difficult, use a very large needle, or even two needles held together. Do not expect a tight casting-on to "hold in" the bottom of a garment. It will only give you a horrid, tight, unyielding edge, which may wear out before its time. There are two basic methods of casting-on, both good. 1. The first consists of making a loop over the right needle, leaving a long tail of wool, which often turns out to be too short (infuriating), or too long (wasteful, and therefore also infuriating). Loop on the stitches, using both ends of wool, or knit them through loops formed on the left thumb. The result is the same. When the tail turns out to be too short, with perhaps just a few stitches to go, take another length of wool, and cast on one stitch with the old and the new wools together, finishing with the new wool. The ends are darned in later, and will never show. Better still, you can cast on using the ends from two balls of wool. 2. The knitting-on method is really the best way to cast on. With it you knit one stitch into your basic loop (no long tail to bother with -- 3"- 4" is enough), and put this new stitch also on the left needle. Now don't knit into it, the way some of us were taught as children, but between it and the first stitch, and put this third stitch also on the needle. Knit between the third stitch and the second, then between the fourth and the third, and so on, always putting the new-made stitch on the left needle. You are making a fine strong flexible border. It may seem tight at first, but a good pull will stretch it into shape. This casting-on, when completed, looks equally well on both sides; a great blessing on any border to be turned up or down. With all the advantages of this method, why do I stubbornly continue to use the long-tail method? I don't know. 3. There are two more peripheral ways of casting-on, the first of which is a series of backward loops over the right needle, useful only in some types of buttonholes, and in emergencies. If you can train yourself to twist the loop before putting it on the needle, it is a great improvement, and may perhaps find yourself using this version frequently. 4. Then there is "Invisible Casting-on" which can prove very useful when joining the end of something to its beginning, or, as I have only recently discovered, when you want to make a sweater from the neck down (not my favorite design) with apparently totally seamless underarms. This casting-on consists of loops formed around a needle and a contrasting auxiliary wool. When the Auxiliary Wool is later removed you will find a row of stitches ready to be picked up, or woven, as the case may be. This is how to do it: Knot wool (W) with a piece of Auxiliary Wool (AW). Place the needle in the right hand between W and AW and hold wools taut in left hand with AW above. *With needle in right hand, come down in front of AW, behind and under W, and up. With needle come down behind AW, behind and under W, and up. Repeat from * until the desired number of stitches has been formed by loops over the needle, simply ducking down alternately in front of and behind AW, and fishing up a loop of W each time. Keep AW parallel to, and under, needle. For the first row, knit into the loops on the needle as you would into cast-on stitches. Pulling out AW when knitting is completed will release the loops to be picked up and knitted down, or woven. I am often asked which is the "right side" of casting-on. My answer is: the right side is the one which looks best to you. I prefer the side which looks like embroidered outline-stitch. 1. This has been limited to only one method. Work two stitches, pull the first one over the second, work a third stitch, pull the second one over it, work a fourth stitch, pull the third one over it, and so on. The main trick is to keep an optimum tension; not so tight that it binds, and not so loose that it looks sloppy; in fact, a happy medium, best attained through practice and experience. Remember to work the stitches as they present themselves, as the French so cleverly put it, "comme ils se présentent," knitting the knit stitches and purling the purl ones. To make a neat final corner when casting off, work the last two stitches together. I always swore I would invent a casting-off method when I had time, and one day, a couple of years ago, I did. It has a disadvantage, as it cannot be ripped, but must be taken out, stitch by stitch, if necessary. But there is an advantage too; it doesn't look like casting-off. Do you have that feeling about casting-off? That it often looks rather homemade? Well this Sewn Casting-off really looks more like casting-on. It is very useful for finishing garter stitch, and in the case of stocking stitch causes it to curl less stubbornly. (Not advisable for ribbing.) I like to use it on enigmatic garments with which I try to puzzle other knitters: "Guess how this was made." The first thing they look for is where I cast off, and if they can't find it they are very often flummoxed. 2. This is the method. Break wool, leaving a good working length, which is threaded through a blunt wool needle. Holding the work in the left hand, *put this needle through the first two stitches as if to purl, from right to left. Pull wool through. Put needle back through the first stitch as if to knit, from left to right. Pull wool through. Slip first stitch off needle. Repeat from *; two steps forward, one step back, two steps forward, one step back. Do not pull the wool too tight, although there is little danger of this. A good way to cast off garter stitch is on the right side in purl. This has a way of curling over on the right side, and of flattening itself on the wrong side. "Casting-on casting-off" has just sprung into being, fully fledged. Although I will claim invention of this technique, I will not claim its original invention. Someone else may have thought of it, and forgotten it again. All I assert is that I have never seen it or heard of it before. This casting-off is a facsimile of casting-on. 3. If you have ever taken out the absolute lowest row of casting-on -- the part that looks like embroidered outline stitch -- you may have noticed that it is in reality very much like outline stitch, being a species of overcasting which links the stitches by pairs. When it is removed it reveals a row of stitch loops, which, in the case of stocking stitch and garter stitch, may be picked up and used for knitting down in the opposite direction. Why not finish your work with a similar row of outline stitch? Break the wool, and thread it through a good blunt needle. Hold the work with the right side towards you, with the wool coming from the left end. Work from Left to Right. *Keeping the working wool above, go into the second stitch from the front, and into the first stitch from the back. Pull the wool through both stitches. Slip the first stitch off the needle. Repeat from *, keeping the tension fairly loose; it may be tightened later. I hope you will soon become sufficiently confident to take the stitches off the knitting needle. Knit 3 stitches. Pull the first over the other two. Knit a fourth stitch. Pull the second stitch over the third and fourth. Knit a fifth stitch. Pull the third stitch over the fourth and fifth. And so on; like regular casting-off, except with three stitches instead of two. If you work it with an extremely large needle, it can be made comparatively loose. 5. Can anything be done about those steps that appear when you are casting off the shoulder-back at the rate of, for instance, five stitches at the beginning of each row? Yes, indeed. Here is a neat trick which I learned from a master-knitter many years ago. Instead of casting off, for instance. five stitches at the beginning of the rows, get rid of one of the stitches at the end of the previous row, by working the last two stitches together; then you only have to cast off four stitches. This is sheer magic, and your shoulder line will have only an almost imperceptible wave, instead of a wicked step. Thank you, Mrs. Neumann. 1. I'm sure you know one way of decreasing-just work two stitches together (K2 tog.) -- but some knitters are not too familiar with its fraternal twin, slip one, knit one, pass slipped stitch over, or sl 1, K1, psso, for short, or, even shorter, SKP. 2. Barbara Walker has, in masterly fashion, transmuted sl 1, K1, psso into SSK (slip, slip, knit), which presents an infinitely neater appearance, as well as being easier to execute, once you get the hang of it. It is also quicker to write and easier on the tongue and teeth; try it. I quote her: "SSK: slip the first and second stitches knitwise, one at a time, then insert the tip of left-hand needle into the fronts of these two stitches from the left, and knit them together from this position." When decreases come in pairs, as they frequently do, you should always employ both of these methods, or your shaping will not appear symmetrical. Which one you use first and which second is up to you, depending on the final results wanted, but be consistent. Knit two together (K2 tog) leans to the right, and slip, slip, knit (SSK) leans to the left, according to whether it is the stitch to the right or to the left which is being eliminated by the decrease. You will soon develop a preference in using these methods, and then a habit. Some knitters have trouble keeping their paired decreases in a strict vertical line; I would advise them to mark the stitches (one, two, or three) between the decreases, and to see to it that these stitches remain inviolate, and never involved in the decreasing. 3. If you wish to decrease two stitches in one fell swoop, then slip one, knit two together, and pass the slipped stitch over. A neat variant of this is to slip two stitches at once, knit one, and pass both slipped stitches over it. 1. There are many ways to increase, but I find myself almost invariably using one which is not too widely recognized, namely, Make one (M1). This is quite simply achieved by putting a firm backward loop over the right needle (A). The result is the same as that accomplished by picking up the running thread between the stitches and knitting into the back of it (twisting it), which produces the effect of the stitch having been made a row sooner. I think my way is faster, and anyway I like it, and I'm used to it. It is the best increase for pairing that I know, as it is a totally separate stitch, made independently of any other and standing all by itself between its neighbors. If you are a perfectionist, you may make the loop as above for the first increase of a pair, and then reverse it for the second (B) -- then your shaping will be absolutely symmetrical. But this is, as I said, sheer perfectionism. Try it out and see if you think it is worth it. 2. The most invisible increase of all is here illustrated. It is formed by knitting into the stitch of the row below from the back; not from the front. That is to say, twist it. I think you will notice quite a difference. This is second only to purling as a knitters' nemesis, which is why I avoid it where possible in designing. Experts can backstitch a seam from the wrong side, and have it come out creditably (if somewhat bulkily), but it is very difficult for the average knitter, who is possibly not fond of sewing. If you have landed yourself with five pieces of sweater to be sewn together, try tackling the job from the right side, where you can at least see what you are doing, and how it's going to look. Start with the shoulder seams, which are nearly always cast off. I rarely weave them, as a sweater needs all the firmness it can muster at this point, and weaving stretches too much. Since it is inadvisable to make the seams invisible, why not make them decorative? To this end, cast off in purl, or even work one row of purl before casting off. Then the seam may be sewn over and over, firmly, stitch for stitch. You may take one stitch from each side alternately, if you wish, so long as the seam lies flat, and is firm. Side seams for stocking stitch may successfully be "woven" vertically, as described in any knitting magazine. This forms a seam which is almost invisible until it is stretched sideways. But why not make side seams decorative too? Keep two or three stitches at each end in garter stitch, by beginning and ending the purl rows with K2, or K3. Slip all first stitches unless you belong to the school which frowns -- or even scowls -- on this practice. An edge of this kind is good-looking, and doesn't curl much, and it may be most successfully joined by taking a knot from each side alternately. Garter stitch garments are sewn up this way, and have almost invisible seams. The ridges of garter stitch also make the rows easier to count, and ensure your having the same number of rows on front and on back. Don't be distressed if your sewing-up fails to please you; you are in the same boat with many excellent knitters. Do as I did; abolish sewing-up altogether by making seamless sweaters. There are several examples later in this book, and I think you will enjoy them. Although this is considered a rare and esoteric skill, it is surprisingly simple if you keep your head. Watch the route of your weaving-wool sharply as you progress, and keep it in the correct path. Don't worry about looseness; tension is adjusted at the end. *Pull wool through 1st st on Front Needle as if to knit. Take stitch off. Pull wool through 2nd st on Front Needle as if to purl. Leave stitch on. Pull wool through 1st st on Back Needle as if to purl. Take stitch off. Pull wool through 2nd st on Back Needle as if to knit. Leave stitch on. Repeat from *, and keep repeating. You will soon see that it is perfectly practicable to perform both movements on each needle in one fell swoop. When weaving is finished, adjust tension of weaving-wool. If you notice some purled stitches, it is because you have put the blunt needle the wrong way through the stitch, and this is worth undoing, and doing over again. 2. Garter stitch weaving is even simpler, but you must be careful to have the correct sides of the fabric together, or you may end up having two "purled" rows too close together or too far apart. The best way to ensure that the fabric is facing the right way is to have the working threads hanging together at the right end when starting to weave. Break off one, and weave with the other. When finishing a pointed garter stitch hood, knit to the middle of the row and fold the sides together. Now keep working the first two steps of stocking stitch weaving: *Pull wool through first st on Front Needle as if to knit. Take stitch off. Pull wool through second st on Front Needle as if to purl. Leave stitch on. Repeat from * on Back Needle, and keep repeating on both needles alternately. Adjust tension. Ribbing, or any patterned fabric, may be woven if the grain of the pieces is running the same way. That is to say, you can weave the top of one piece to the bottom of another piece, but you cannot weave the tops of two pieces together; the pattern will be half a stitch off. Two tops can only be woven together in stocking stitch or in garter stitch. There is no sense in weaving unless the result is absolutely undetectable; if this is impossible I think it is better to have a good honest organic seam. My current favorite is the garter stitch border, which is easy, firm, flat, and the same on both sides. When pulled laterally, it loses its rather "kindergarten" appearance, and looks mysterious, like afl Unknown Stitch. I have devised a buttonhole which almost disappears into it. Why don't you try just one garter stitch border and see how it suits your taste and temperament? Suppose you have a nice cardigan on hand, finished except for the front and neck borders. Take a pair of 14" needles one or two sizes smaller than those used for the body of the sweater; a long circular needle will do too. Starting at the lower right-hand corner, with the right side of your work towards you, knit up one stitch in each of the first two rows of your knitting. Do this about one and a half or two stitches in from the front edge, wherever the knitted fabric starts to look tidy and even. Skip the third row, and knit up a stitch in each of the fourth and fifth rows. Skip the sixth row; work into the seventh and eighth rows, and so on up the front. You will have two-thirds as many knitted-up stitches as there are rows, which will give a border that neither puckers, flares, nor droops. When you come to the neck, knit up around it, stitch for stitch, and so on down the other side. You will notice that I say "knit up" and not "pick up." This means that you are better off pulling the wool through with the needle for each stitch. Some people pick up the stitches with the needle, and then knit them off. I think that this is because the term "pick up" has misled them. Now work the border, back and forth, in all-knit, increasing two stitches every second row at center neck front, for a mitered corner. For a reverse-miter -- if I may so express myself -- at inner corners, decrease two stitches every second row. You may keep the actual corner stitch in stocking stitch on the right side, by purling it on the wrong side, and then, of course the mitering increases or decreases are worked on either side of the corner stitch. Buttonholes, if any, should be placed at half the desired border width -- after perhaps three or four ridges. On the row on which they are made you may wish to decrease away about one quarter of the back-of-neck stitches (K2, K2 tog across). This is because of the marked tendency of neck-backs to become loose in their ways. When you have worked about as much again, and the border looks right, cast off, in purl, on the right side. Borders may also be worked in seed stitch of K1, P1, alternated every row. A border on a garter stitch garment needs a different proportion of stitches to rows -- one stitch for every ridge (2 rows). If you have decided on an elastic ribbed lower edge for your sweater, do the job thoroughly -- put in at least thirty rows of K2, P2, rib. If you want an inelastic border of K1, P1, rib, make it any length you want, from 2" on up. You may coordinate the front borders by making them also in ribbing. Try to center the ribs at neck-front corners, as this is one of the spots on a sweater where stitch-perfect knitting pays off. These words are being written on a desert island in the middle of an unpopulated lake in Ontario. It is a sparkling clear day in early September, and I am working on a small experimental sweater-from-the-neck-down. This is not my favorite kind of sweater, and I doubt if it ever will be, since all the excitement and interest of the shoulder shaping comes at the beginning, and one is left with the endless and boring straight body and sleeves to complete. Its one excuse for existing is its indispensability for children, whose sweaters must eternally be repaired and lengthened at the lower edges. Well; I have finished the sleeves, ending them with ribbing at the wrists, and am approaching the lower end of the body on a hundred stitches. I am faced with still more ribbing, and a cast-off edge, which is hard to do neatly and elastically in ribbing. I am discouraged. Let us see if ruse and subterfuge will solve my problems. I am greatly helped in my undertaking by having run out of wool. I have been using the classic unsurpassable pale gray Shetland -- six stitches to one inch. The only other wool I have is some handsome cocoa-colored 2-ply Sheepwool -- five stitches to one inch. Now all wools have their optimum GAUGE for specific purposes and knitting worked at six stitches to one inch in wool which is best suited to five stitches to one inch would have a hard, thick, unyielding texture, fine for a wind- and waterproof sweater for a large mariner, but no use to a small child. I must somehow combine it with Shetland and come up with an acceptable result. Whichever way you slice it, the sweater will have a heavy border, as the new wool is so much thicker. Let us turn the unavoidable to good advantage, and finish with an honest heavy border of garter stitch. First I will blend the two colors and textures by the use of a small-repeat one-to-one pattern. After two inches of this I will put in one purl round, then three rounds of knit, having abandoned the gray Shetland at the end of the pattern. The work will start to flare out, as a hundred stitches in Shetland measure 16 1/2", while in Sheepswool at five stitches to one inch they measure 20". So in the last of the three rounds I will decease 25% to 75 stitches by working K2, K2 together, around; firstly because of the thicker wool; secondly because garter stitch has a lateral spread; thirdly because the bottom of any sweater needs holding in. All right; then one purl round, then two rounds of knit, then one round of purl; knit one round; purl one round, and finish off by casting off in purl. Just a minute while I do it. It worked. And would have worked just as well in all Shetland, but without such a sharp decrease. The purled cast-off neatly conceals its extreme looseness. For an adult sweater I would, of course, make the whole border longer, and work five or six knit rounds between the first two purl rounds before tapering down to nothing. I think it would look just as good. I'll not venture to say that a border like this has never been made before -- there is nothing new under the changing moon -- but I will say I've never seen one. It saddens me to think of all the things I may "invent" too late to be included in this book. Another good way to make a lower border is with a hem. Knitted hems have found much favor during the last ten years or so, but I have yet to see one that is logically designed. Most of them show a lamentable inclination to flare out, right? Very occasionally, directions will admonish you to work hems tightly on smaller needles. But why do no printed directions suggest having less stitches for the inside of the hem than for the body of the sweater? Just 10% less will do it, or fewer, if you wish. For a 200-stitch sweater, cast on 180 stitches, work an inch or so for the hem, then K9, Make 1, around. Knit one more round, purl one round for a sharp turn, and sail away on and up your sweater. My favorite way is the reverse of this; start the sweater with no hem at the lower edge -- just regular casting-on -- and during the days and weeks of knitting, meditate on this hem. Shall it be a different color? A bright one or a subtle? Shall it contain a modest pattern? You'll have plenty of time to make up your mind. When the time comes to start the hem you may either knit up one stitch in every cast-on stitch, and purl one round, or knit up in the loops just behind the cordlike round of casting-on. This gives an unusually neat turn, and a purl round is unnecessary. In either case knit one round before you decrease, and then K8, K2 together around for a 10% decrease. You may have your decreases even closer together if you want a snugger hem. Use your judgment. You may include any small pattern that appeals to you, in a different color, or the name of the recipient of your labors, or any motto, axiom, or family joke that seems appropriate. The letters of the alphabet are quite easily worked out on squared paper, and need take no more than five stitches in height. Few names can fill the entire circumference of a sweater, so join the pattern-wool anew every time you come to the first letter; this means only five threads to darn in on either side. You may care to fill the space with stars or flowers. Be careful not to knit LEON XUEYOJ -- it has been known to happen. You'll have to decide for yourself which way up the legend should be -- towards the wearer or towards admiring friends -- I've not yet made up my mind about it. When the hem is the length you want it -- anything from 1 1/2" on -- do not cast off. I rarely cast off if I can avoid it, and beginning and intermediate knitters may also welcome a way of avoiding it. Anyway, hems are much better off without a tight, neat or, alternatively, a loose, untidy casting-off. Break your wool at a respectable length, and thread it through a very large, very sharp wool needle. Take out the knitting needle; without screaming, please; the stitches can't go anywhere; and -- for the first few times, anyway -- baste the hem flat with thread. Few things look worse than a hem pulled up so tightly that the sewing-stitches make dimples on the right side, or so loosely that the hem itself shows below the fold line. Sew the hem down, stitch for stitch, taking just a skimming of the sweater fabric, and keeping the stitches good and loose, so that the hem will stretch as much as the sweater if necessary. And there you are. Give it a breathy patting on the wrong side with the steam iron, and you will find that you have a fine, flat, unflaring hem. If worked in finer wool than the sweater proper, it will lie even flatter. In finer wool I also decrease 10%. Or nearly always. A very pretty way of turning a hem is to work Yarn over, K2 together for one round. The resulting row of holes has a fine natural turn. It looks best on women's and children's clothes. Opponents of circular sweaters -- and there are unfortunately some -- take as one argument the theory that being without seams, circular sweaters don't hang together properly. A fallacious argument if ever I heard one, but let us refute it by putting in imitation seams, which are rather good things anyway, and a neat and mysterious feat of skill to boot. They may be made by slipping the seam stitch every second round, but this is a rather tiresome thing to remember while you are peacefully working your way up your lovely circular sweater, with no interruptions, and thinking great thoughts. Phoney seams are great fun to make later, and the technique will, I think, prove to you that you are the absolute boss of your knitting. Before you cast off, find the exact side or seam stitch, and drop it clear down to the first round of body or sleeve underarm. This makes, of course, a monstrous runner. Take a crochet hook, put it through the stitch of the first round, and hook the next two stitches through it together. Then one stitch, then two together again, then one stitch, then two, and so on, up to the top of the piece. You will have 2/3 as many rows in the "seam" as in the garment itself. This forms a very efficient-looking vertical ridge which almost appears pressed in, and is absolutely ineradicable. It not only looks well, but it also helps greatly when the time comes for blocking or for folding the sweater. You can even make a phoney seam on a old, already-completed sweater. Snip one stitch at the underarm, and let a stitch down from there in both directions, later repairing the original snip by weaving -- it will never show. In the case of sleeves, be careful that the runner doesn't become involved in the shaping at the lower sleeve underarm. If this happens, stop the runner right there. It is to guard against this contingency that I leave three full stitches between sleeve decreases or increases. I have only one pocket which is not available in any of the good knitting books. I call it the Afterthought Pocket, as you really don't have to give it a thought until the garment is finished. Try on your new, nicely blocked sweater, look in the glass, and make a wish for pockets; your wish is as good as granted. Decide where you wish you had thought to put them; I like them at the point where my middle finger hits my hip bone. Mark the exact point, and horrors! snip one thread of one stitch right there. Measure exactly, and make an identical snip on the other side. You will think you now have the genesis of two appalling holes, but you are deceived. Unravel the cut ends carefully for ten stitches to right and to left, and you will have made a neat 20-stitch opening. This opening will be edged with 40 little stitches, pleading to be picked up. Pick them up; two sock needles for the top ones and one sock needle for the bottom ones. Take wool and the fourth needle, and start knitting around, from the right side. If you remember to purl the bottom 20 stitches on the first round, your front pocket-edge will have a good sharp fold-line. When you have worked far enough to have achieved a pocket of the depth you want, weave (or even sew) front and back together, and pop the pocket into place. Neaten the two corners with the unravelled wool. Now aren't you proud of yourself? Go ahead and put pockets everywhere you've always wanted them. If you can't match the wool, pretend you wanted them in a contrasting color. I have been known to take out a pair of pockets in an ancient sweater which had sagged unaccountably (yes, Virginia, this can happen to anybody), and put them in again higher up. The original pockets had been snipped and unravelled, so the scar was totally invisible. There is a similar pocket for which you plan ahead by knitting in a thread of contrasting wool, but this one cannot be caused to disappear without a trace. Besides, what's the sense of planning ahead unless you have to? You spend so many hours knitting, your thoughts running in and out with your needles; how satisfying not to be committed to too many details in advance, and to be able to incorporate later some of the new ideas that come to you while you are doing the donkey-work. There has been a regular boiling-up of these recently, so that there is no longer any excuse for making pigseyes. You are surely familiar with one of the several versions of the one-row buttonhole. Here is my own three-row button-hole, which I still use almost always: Row 1. Cast off the required number of stitches, very often three. Row 2. Cast on the same number of stitches by the primitive method of making three backward loops over the right needle. Pick up the first stitch you cast off in the previous row (it should have the same running-thread as the stitch next to it; the first one on the left needle). Put this stitch on the left needle and knit two together. Row 3. Quite simple. When you come to the three cast-on stitches, knit into the back of each, and also into the back of the stitch immediately following them. Buttonhole completed. The two stitch-tightening techniques used here -- picking up an odd stitch and knitting it together with its neighbor, and twisting a stitch by knitting into the back of it -- will prove true friends on many occasions. The first helps when a hole is made by turning in the middle of a row and working back (pick up a thread where it looks loosest -- experiment -- and knit it together with the stitch proper). The second helps when that tricky hole appears at the ankles of socks (knit into the back of the loose stitch). It is little dodges like these that make a craft a joy; some of them one picks up from friends and enemies; some of them one discovers for oneself. 2. Here is another buttonhole. 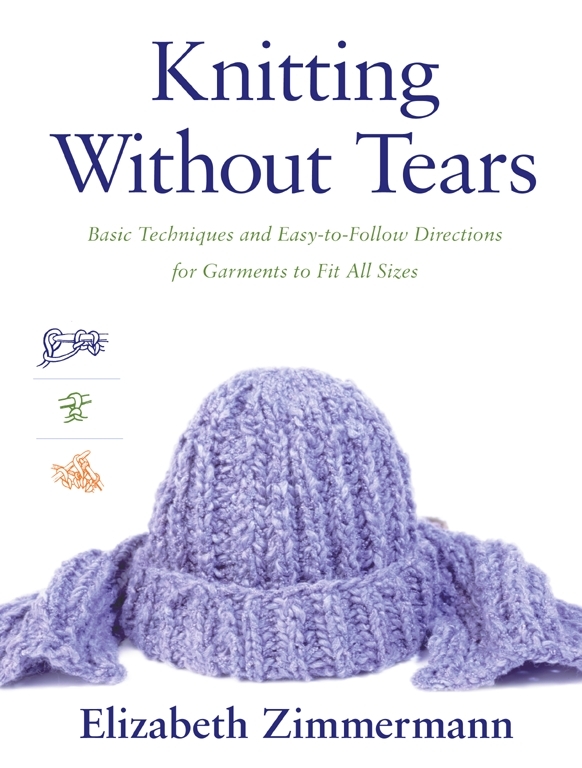 This is its first appearance on any stage -- it's only a year old, the little thing, and is chiefly aimed at experienced and courageous knitters. That ought to put you on your mettle. It is useful primarily in two-needle sweaters where the border is incorporated with the body of the garment, and where you are not quite sure where you want the buttonholes to be. Hark back to the Afterthought Pocket and snip just one thread at the center of where the buttonhole is to be: Unravel only slightly -- three stitches on the bottom and three on the top are usually enough. Now hark back again, this time to Sewn Casting-off and cast off the stitches by this method. When you come to the last stitch on the bottom, treat the stitch next to it (the one in the fabric) the same way, and then continue across the top. Fasten the end and the beginning securely, and finish off the short ravelled ends by resourcefully darning your needle in and out before you thread it. This buttonhole is not nearly as tricky as it sounds, but for goodness' sake make a few practice ones before you put the first one in an actual sweater. You may like to use finer matching wool. If this is not available, split your wool, and twist it tighter before working with it. If you have mastered "casting-on casting-off", here is a good opportunity to try it. The enormous advantage of this buttonhole is that it can be added when a garment is completed, and you know exactly where you want the buttons to be. It is not always too easy to determine this when you put in the buttonholes on the way up. Sometimes you end up with the top one and its neighbor being too close for comfort, or disturbingly far apart. Of course, one way out of the dilemma is to make the button side first. Hold it up against you and space the buttons as you want them. Then all you have to do is make matching buttonholes on the other side. Unwind a yard or so from the ball, and anchor it with a needle. Climb up on a chair, take some of the plies in one hand and some in the other, and pull gently. The ball will spin giddily, and the wool will unwind. Keep repeating this process, which is faster and more effective than you would think. If you inhabit a stately mansion with an imposing staircase, you can do many yards at a time. The top of a tall building would be better still, but you would be at the mercy of the winds and practical jokers. Twisted stitches, dropped stitches, split yarn stitches, or inadvertently "made" stitches may be neatly remedied by your trusty crochet hook. Trace the offending stitch up to the needle, work to this point, and then let the stitch run down to where the trouble is. Actually, the word "run" is inaccurate, as, contrary to superstition, a dropped stitch does not immediately zoom down to the bottom of your work like a run in a stocking. At the most it will slither down one or two rows, and cling there, moaning piteously, and waiting to be picked up; if it has to descend any further, it must be helped. When you get it to where the trouble is, fix the error, and crochet-hook the stitch up again. Your intelligence will tell you when to hook it to the front and when to the back, if you are using a pattern containing both knit and purl stitches. If you don't get it right the first time, let it down again, and give it another try. It can, and should, be perfect. In the case of a dropped stitch from several rows back, the job will be a tight one; it has been ignored for several rows, and there is not sufficient wool in the succeeding rows with which to hook it up. You therefore have to borrow wool from the stitches each side of it every row. If you are eliminating an unnecessarily "made" stitch, the reverse is true, and the slack must be pulled sideways to be absorbed by the stitches to right and left. Try to look at your work objectively every few rows, to check when things like this have occurred, so that you can catch them before they become too deeply entrenched. I once discovered a contrary cable right at the beginning of an almost finished sweater. I let down a giant runner of six stitches to where the error was, picked up the six on a short sock needle, corrected the cable, and knitted my way up again, with six stitches and two short needles, from right to left, and working the cables as they came. It looked a bit cockeyed until it was blocked, and yanked into seemliness while damp and steamy, but then it was completely unnoticeable. I wouldn't take this trouble any more, by the way, but would snip one stitch a couple of rows above the error, let down the stitches, correct the error, knit the stitches up again, and then weave the snipped row back in. I am truly boss of my knitting. I would also eliminate an indelible stain this way, if it wasn't too big, by extracting and replacing the offending rows, one at a time. Mrs. Zimmermann, how do you join in a new ball of yarn? Do you always join at a seam? My dear, my sweaters usually have no seams, and besides, as a knitter with reverence for her material, I hate to waste an inch of wool. Do you split the yarn and twist half the plies of one piece with half the plies of another? No; too lazy. And this is troublesome to do perfectly anyway. Do you tie in your yarn? Heavens, a KNOT? Let me put an end to this catechism and tell you that I join in a new ball of wool, always, by working just one stitch with both wools together, the old and the new, leaving 3" tails hanging down on the wrong side. These are later darned in lightly for about an inch, with a large sharp needle, and snipped off. And I defy you to tell from the right side where this was accomplished. A perfectionist may take out one of the ends from this double stitch, make half a square knot with both ends, and darn in lightly as above, after checking the tension carefully on the right side. When joining in a different colored wool, the above method is of course impractical, as a double stitch with two colors would be unsightly. I just start knitting with the new color, leaving two tails and a looseness. When the work is finished I must admit to making a square knot (after adjusting the tension very carefully) before darning the ends in. Why I do this with different colors and not with wools of the same color, I can't tell you -- superstition perhaps. But one thing is certain -- never knit a knot. No matter how careful you are to keep it on the wrong side, it usually pops through to the right side to haunt you. There is a strong human inclination to regard knots in new wool as acts of God, and to knit on. Don't. Break the wool at the knot and treat it like a regular join. If the skein has an unusual number of knots -- say more than three -- drop a card to the manufacturer, telling him the dye lot. If he is on his toes, he will be grateful. Now comes what I perhaps inflatedly call my philosophy of knitting. Like many philosophies, it is hard to express in a few words. Its main tenets are enjoyment and satisfaction, accompanied by thrift, inventiveness, an appearance of industry, and, above all, resourcefulness. Resourcefulness is probably the key word. Primitive societies herded sheep, presumably for milk, meat, and skins. How resourceful to gather stray tufts of wool from thorns and briars and spin them into yarn. How resourceful to experiment with knots and loops on two sticks, and eventually to resolve the tangle into the prototype of some form of knitted fabric. Weaving took place at home, but knitting could accompany the shepherd, the sailor, the woman walking to the fields, anybody who at any time had idle hands. Today knitting can still fill odd moments. Think of the frustrating periods of time we spend just waiting; waiting for the coffee to boil; waiting in the car; waiting until the fish bite; waiting until somebody else's favorite program is over and we can switch channels; we all have our own particular waits. Those who ride daily to work could finish a sock in a week if they would spend the time knitting. Imagine! Twenty-five pairs of socks a year. Twenty-five Christmas present problems solved. Have you realized how most men yearn for proper socks ? Men I hardly know at all are constantly and wistfully and broadly hinting that I make them a pair. Sometimes I do. My own husband is so well supplied that I practically never have to mend any socks, as the wear is spread out over so many pairs. It's like the women who get married with a dozen dozen sheets and towels; you never see them at the white sales. So there is knitting as a time filler. As a brace for the human spirit it is just as effective. How gratifying it is to see one's family warmly, comfortably, and even fashionably dressed in garments that really suit and fit them, and which will fit their siblings in time to come. Don't say to the younger child, "Here is Sebastian's old sweater that you may as well wear out." Say, instead, "Sebastian is growing so fast that he can't wear his favorite beautiful sweater any more. Let's wash it, and mend it, and put it in a plastic bag, and when you are big enough, perhaps he will let you wear it." Resourceful? You bet. When making a cardigan I always put buttonholes on both sides, so that it can change its gender easily. Girls love to wear boys' sweaters, but, strangely, the reverse is far from true. I try to convince myself that I have no favorite sweaters, although I always make a great fuss over the latest designed, but I am especially fond of those constructed on the resourceful elimination of two of the most common knitters' dislikes -- the dislike of purling and the dislike of sewing-up. The second is an expensive dislike, as it is so strong that one will pay to have the sewing-up done by somebody else. Let nobody say she can't sew up a sweater -- she just doesn't want to. Reminds me of the infuriating remark, "I've always wanted to knit, but I just can't." Pish, my good woman, you can plan meals, can't you ? You can put your hair up ? You can type, write fairly legibly, shuffle cards ? All of these are more difficult than knitting. You just don't want to knit, so why pretend that you do? It's not compulsory; take up something else. Seamless circular sweaters solve both the problem of purling and of sewing-up, and are actually very logical besides. The human being is so constructed that it can be completely covered by a series of shaped tubes. Tailors and dressmakers succeed excellently and skillfully in making tubes out of fiat woven material; their achievements are nothing short of marvelous. But we, the humble knitters, can fabricate natural-born tubes by the very nature of our craft of circular knitting. With the techniques of increasing and decreasing at our command, we can shape or even bend the tubes as we will, without seams, gussets, or darts. It is then only a matter of uniting the various tubes by knitting them together, or sometimes weaving them together, and we could, if he desired them, make long-johns for an octopus. Later chapters in this book contain examples of my seamless sweaters more or less in the order in which they were designed. The first is a ski sweater with classic dropped shoulders, which is not entirely seamless, as the armholes are cut. Then come the true seamless ones, yoke sweater, raglan, saddle-shoulder, and the new "Hybrid." As far as I can see, that just about wraps up the possibilities, but I have been fooled before in like circumstances, and who can tell? Thus you will see that out of my innocent aversion to purling and sewing-up have come comfortable and functional sweaters, which hundreds -- perhaps thousands -- of knitters enjoy so much that they make them again and again. All designs given are for 40" sweaters on 200 stitches at a gauge of 5 stitches to 1". They may be varied endlessly by changing the color, the gauge and the stitch. The percentages I give for measurements are meant for the average person, and which of us is truly average? After you have made one of these sweaters, you may wish to change the percentages a bit to suit your taste, or the shape of the wearer. Feel free. I shall have failed in my endeavor if you copy my designs too slavishly; they are intended only as a guide, so be your own designer. No two people knit alike, look alike, think alike; why should their projects be alike? Your sweater should be like your own favorite original recipes -- like nobody else's on earth. Vogue Knitting Elizabeth taught us to trust our instincts, revel in our creativity and above all, find joy in the simple act of knitting. The New York Times [Elizabeth Zimmermann] brought a penetrating intellect and a sculptor's sensitivity to revolutionizing the ancient art of knitting.